If a baby tooth is knocked out, control bleeding by applying pressure with gauze or a clean cloth. Do not reinsert the baby tooth into socket/hole in the gums as this may cause damage to the developing permanent tooth. Do not hesitate to call Dr. Nick at 303-793-0899 with any questions or concerns. Handle the tooth by the whiter, top portion (the crown). All efforts should be made to minimize touching the skinnier, bottom portion (the root) of the tooth. Rinse (DO NOT scrub) the root gently with saline or water to remove any debris. Reinsert the tooth into the socket (hole in the gums) with firm pressure. 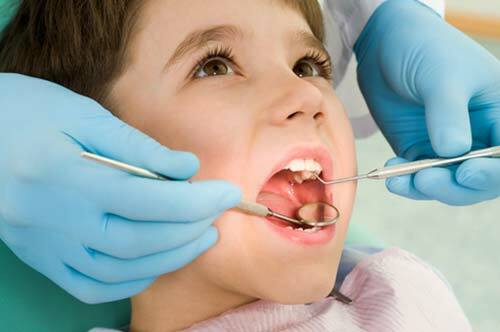 Have your child hold the tooth in place with gentle finger pressure or by biting on a clean cloth. If you are unwilling or unable to reinsert the tooth, then place it in a cup of milk or your child’s saliva. Call Dr. Nick immediately (303-793-0899). Minimizing the amount of time the tooth is out of the mouth is of utmost importance in creating a favorable prognosis for this tooth. Clean the symptomatic area carefully by brushing and flossing to remove any food that may be trapped between the teeth. Have your child rinse with warm salt water. You may give your child Children’s Tylenol, Motrin or ibuprofen; however, this will only provide temporary pain relief. Call Dr. Nick as soon as possible to determine the source of the discomfort and provide treatment accordingly. Our office is available for emergencies. Please call the office at 303-793-0899 should one arise. There is a service number to reach the dentist during after hours.